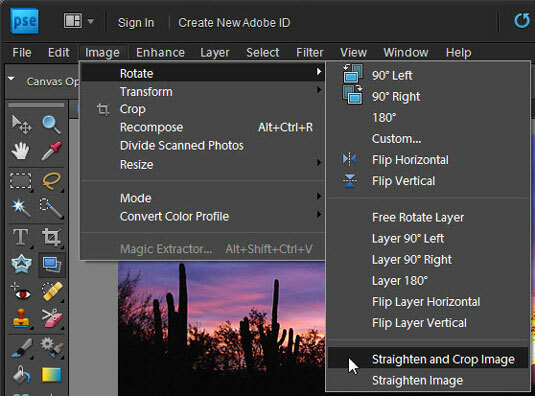 Photoshop Elements provides several ways to straighten your images. You may have an image with a crooked horizon line, or maybe you scanned a photo and it wasn’t quite centered in the middle of the scanning bed. After your next photo shoot, launch the Elements editor and then straighten your images before you show them off. Select the Straighten tool from the Tools panel (or press the P key) only in Edit Full mode. Straighten tool settings on the Options bar. Grow or Shrink Canvas to Fit: Rotates the image and increases or decreases the size of the canvas to fit the image area. Crop to Remove Background: Trims off background canvas outside the image area. This choice is helpful if you scan an image and white areas appear around your photo that you want removed. Crop to Original Size: Rotates your image without trimming off any background canvas. To automatically straighten an image without cropping: Choose Image→Rotate→Straighten Image. This straightening technique leaves the canvas around the image. To automatically straighten and crop the image simultaneously: Choose Image→Rotate→Straighten and Crop Image. Straighten menu commands on the Image–>Rotate menu.